SUSANVILLE, Calif. – Hunting seasons are getting underway on public lands, and the Bureau of Land Management is reminding hunters in California to use caution and observe seasonal fire restrictions. Seasons for upland game birds, waterfowl, mule deer and pronghorn antelope run through the fall and early winter, and most BLM-managed public lands are open for hunting. The California and Nevada departments of wildlife regulate hunting. Regulations are posted at www.wildlife.ca.gov and www.ndow.org. Novosak said it is important that hunters are certain about where they are hunting. If on private land, they should have landowner permission. 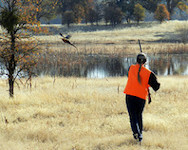 On public land, shooting is prohibited from or across roads, or in recreation sites. Hunters should always be certain about having a clear line of sight toward their target. The BLM also noted wildfire danger remains high this fall and fire restrictions remain in effect. Campfires and barbecues are allowed only in posted, designated campgrounds and recreation sites. Public land visitors can use stoves and lanterns using gas, jellied petroleum or pressurized liquid fuel outside of posted recreation sites. Users must have campfire permits. Permits are available free at BLM, U.S. Forest Service and CAL FIRE offices and online at http://www.preventwildfireca.org/Campfire-Permit/. Information about fire restrictions on public lands is available at https://www.blm.gov/programs/public-safety-and-fire/fire-and-aviation/regional-info/california/fire-restrictions.